Made from stainless steel, the sculpture is an example of the socialist realistic style, as well as Art Deco style. Made from stainless steel, the sculpture is an example of the socialist realistic style, as well as Art Deco style. 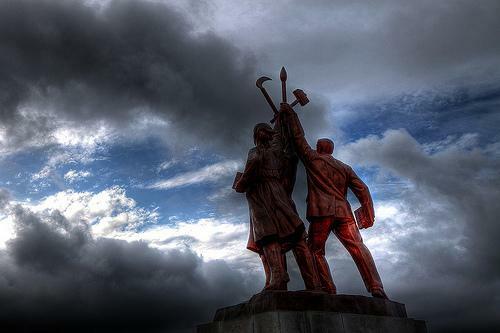 The worker holds aloft a hammer and the collective farm woman a sickle to form the hammer and sickle symbol.